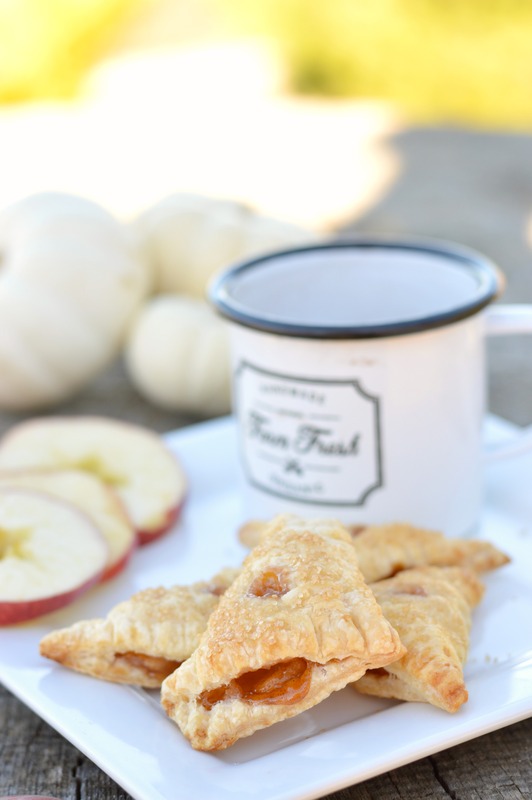 These Bitty Bite Apple Turnovers are the perfect little Fall treat!! Aaaaahhh…I love Fall baking!! There’s something so delicious about all those Fall spices and comfort desserts!! 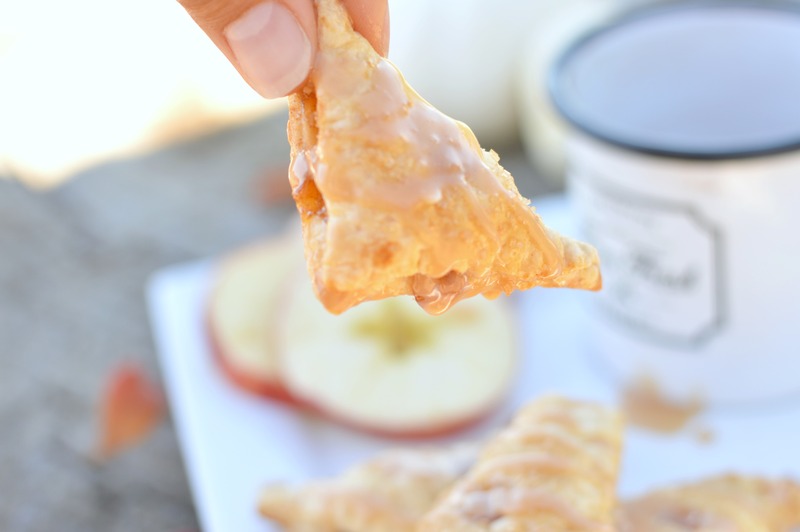 These little turnovers are done in a matter of minutes, especially when you already have your apple pie filling done ahead of time (which is what I did). What I suggest is to make a bit batch of homemade apple pie filling (please don’t use store bought, you really don’t get the same delicious taste) and whenever you want to make an apple dessert, all you have to do is get some from the fridge and your dessert time is cut in half!! You can also do the same with homemade caramel sauce. I mean, what are apple turnovers without caramel sauce? 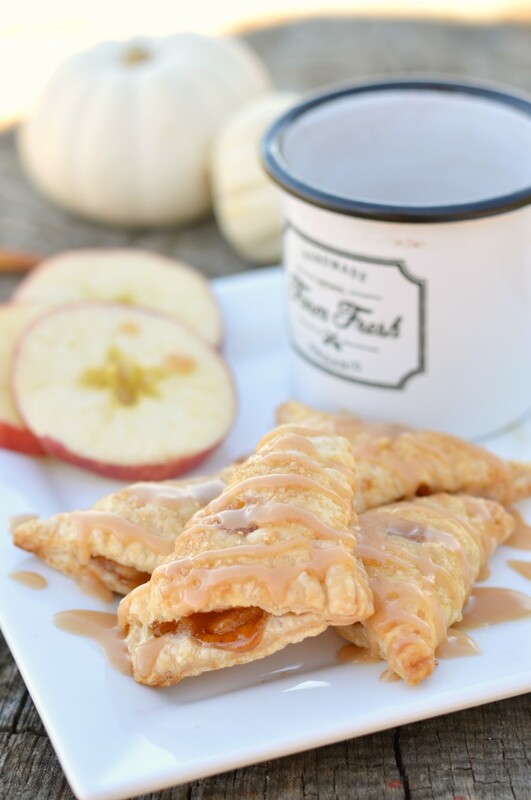 They’re still super delicious, but adding caramel sauce is bringing them over the top!! Seriously guys, make some homemade caramel sauce one day and I promise you’ll come back and thank me later. Especially if you’re using it for these turnovers!! Not to mention that they’re bitty bite which means that you can feed an army with them (jk,jk,) They’re just little bites of deliciousness that’s what. And it’s what you should be making this Fall! Especially since you have so many parties and gatherings to attend. Am I right? If you’re making homemade caramel sauce, I suggest you start with that first since it does need time to cool. To make the caramel sauce: In a large non stick sauce pan combine the sugar and water, cook over medium low heat until the sugar dissolves without stirring ever! Just swirl the pan around. Once the sugar has dissolved, turn the heat to medium high and let it bubble away until it turns a deep amber color, about 8 to 10 minutes. Turn the heat down to low at this point and add the warm heavy cream slowly. Be careful because it will bubble vigorously. Keep whisking until everything is combined and turn the heat off. Add the butter, salt and vanilla and whisk in until the butter melts. Set aside to cool completely. For the apple filling: Peel, core and dice your apples. Add the white sugar, brown sugar, cinnamon, lemon juice and arrowroot powder and mix until combined. Pour the mixture in a pot and place over medium-high heat stirring occasionally. Leave them on the stove for about 5-8 mins. until the mixture has thickened and the apples have softened. Take the apples off the heat and set aside until completely cooled. 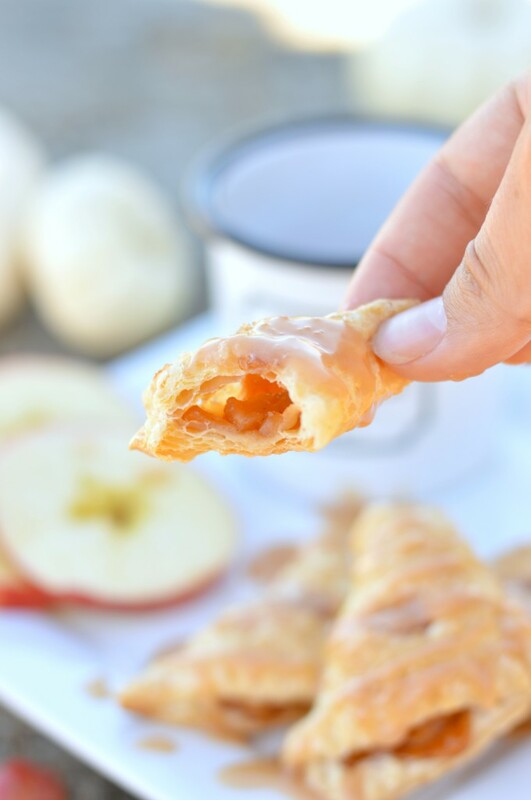 After the apple mixture has cooled, place your puff pastry on a floured surface and roll it out a little bigger. Cut out small squares about 2 in. long and wide. Place about 1/2 a Tablespoon in the middle of each square. Brush the edges with the egg wash, and fold into a triangle crimping it with a fork. 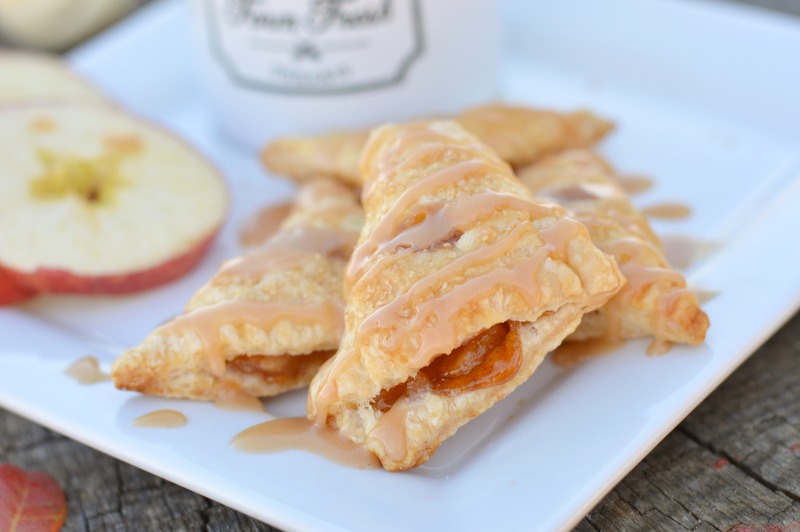 Place your mini turnovers on a greased baking sheet, and cut a slit on top of each one. Brush all the turnovers with your egg wash, and sprinkle with raw sugar. Bake at 350 degrees for about 20 min. or until golden brown. 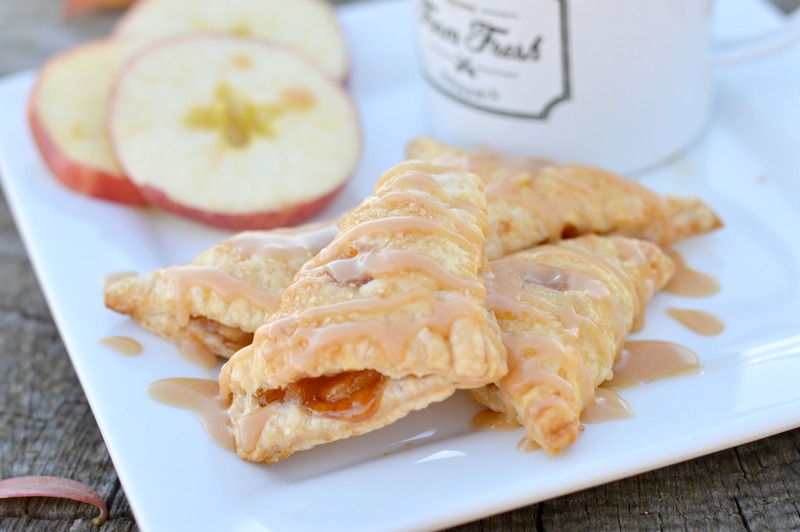 Let the turnovers cool for a while before drizzling with caramel sauce.